Walker Zanger is pleased to announce the expansion of one of its most successful and timeless collections, Studio Moderne™ Stone. Created by noted interior designer Michael Berman, the Studio Moderne Stone extension features four new profiles in 10 trendsetting variations. The new designs further develop the collection’s homage to the spirit of American modernism, reflecting the Art Deco and Hollywood Regency movements while imparting a softer color palette that’s at home in today’s interiors. 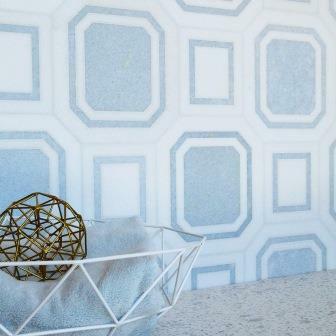 “Walker Zanger is proud to be working with Michael Berman once again to collaborate on a new iteration of our popular Studio Moderne Stone collection, developing beautiful natural stone mosaics in tactile designs,” said Erika Egede-Nissen, Walker Zanger Director of Marketing. “Incorporating crisp Calacata white marble, serene steel gray limestone and a gorgeous new Celeste blue marble, my new designs recall the elegance and simplicity that are synonymous with Art Deco and Modernist forms,” said Berman. The Studio Moderne Stone extension is a part of the new Curated Elegance collection by Walker Zanger, which includes three separate tile collections that take natural stone to a new level of grandeur. The collections’ colors work in harmony to deliver a sophisticated design experience. Visit walkerzanger.com/curatedelegance to learn more.